Instead of protecting clean air, Acting Administrator Andrew Wheeler is trying to weaken safeguards that protect our most impacted communities. More than 1.81 million Latinos live within a half mile of oil and gas facilities and the number continues to grow. Toxic air pollution from the oil and gas industry causes many Latino communities to face an elevated risk of cancer and 153,000 childhood asthma attacks each year. Now the Trump administration wants to weaken clean air safeguards that protect Latino communities from methane pollution caused by the oil and gas industry. By gutting these protections, the administration is putting profits for the oil and gas industry ahead of the health of frontline communities, who often bear the brunt of this toxic pollution. 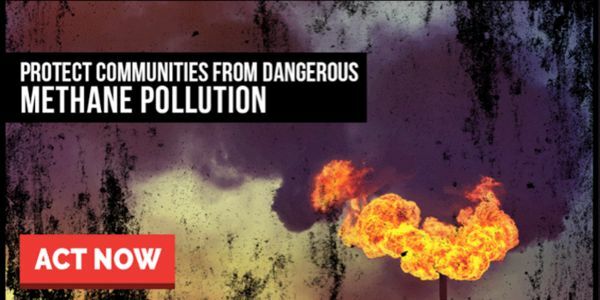 Speak out today - and demand that strong methane pollution standards stay in place! I oppose this move to gut the EPA's methane pollution standards. Rather than weakening these critical protections, we need the EPA to strengthen methane pollution safeguards. We depend on the EPA to protect us from the harmful pollution that makes it harder to breathe – and we need the EPA to fulfill its mission to "protect human health and the environment" by not letting corporate polluters put our children's health at risk. It is the EPA's obligation to protect all communities from harmful methane pollution. Any attempt to weaken or dismantle standards that cut pollution from the oil and a gas industry is a direct assault on our health and environment – and the EPA should not be complicit.